We're very fortunate to live in an area of the country where lightning bugs are a fun part of Summer evenings. 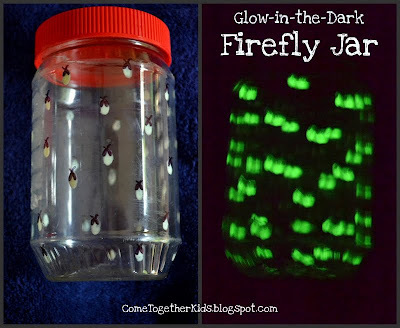 I have so many childhood memories of running around in the backyard after dark collecting fireflies in a jar and I'm so glad that my kids get the chance to do the same thing now. Unfortunately, we often have problems at the end of the evening when they have a jar full of fireflies and it's bedtime. They don't want to part with their glowing, flickering jars of light, but I don't really want a jar full of bugs in the house (especially when it'll be a jar full of dead bugs by morning). When I came across these cool, glowing jars on Pinterest, I had an a-ha moment that would solve our problems. I made a jar that would continue glowing even after we let the bugs free and came inside. 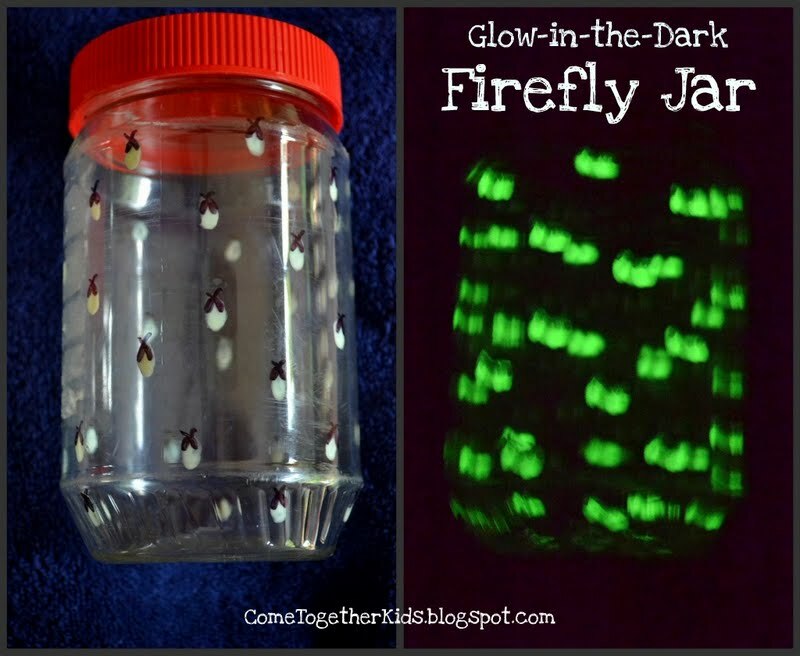 By using glow-in-the-dark paint, painted fireflies "glow" with the lights out! 2. Paint small ovals on the INSIDE of your jar using the glow-in-the-dark paint. Add a second coat if it needs more coverage. 3. Using your Sharpie, add the lightning bugs' antennae and wings on the OUTSIDE of the jar. 4. That's it!! On the next nice evening, take your jar outside and fill it with flickering fireflies. When it's bedtime, let the real fireflies loose and bring your jar inside. We put ours near a bright light while we brush our teeth, then put it next to our beds to watch the glowing lights as we fall asleep. It was so simple and has worked great for us! what a great idea! now i want to run to the store and get some glow in the dark paint!!! Brilliant! I will be making one for my daughter! I love these!! I am going to make these with my son this weekend. Thank you!!!! 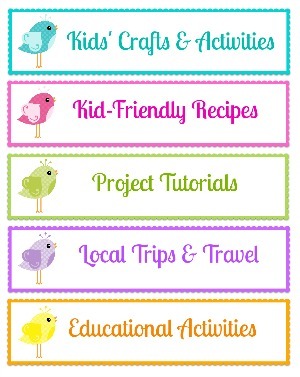 I love seeing Pinned projects in action. You're brilliant! 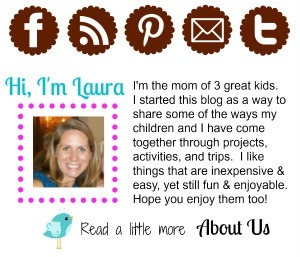 This is too great, Laura! How cute! The other day my son wanted me to buy him a jar of fake lightning bugs. What a great substitute. We are certainly putting this on our craft list. Cute! I saw those jars on Pinterest too and we made some. I love how yours are fireflies though, darling!! Great! My daughter would love this! Wonderful Idea - great to add to a camping or bug theme! Very cute idea! I wish we had lightening bugs where we live. I loved catching them as a kid. I am loving this idea. I can see a whole set of different sized jars for storing little items in a playroom or kid's room that would also serve instead of a nightlight. This would be much more fun. Thanks for sharing. We are fortunate to have fireflies where we live too! I love this idea, so clever. Found you through Craft-o-maniac. I'm your newest follower! Such a cute, simple idea. Love it! I have to make this for my kids. We jut moved to Utah from MI and there are no lightning bugs, they miss catching them so much. thanks for the wonderful idea. I'm now a follower of yours. Thank you so much for linking up to my Tuesday Confessional link party. You were featured so grab a button and get your brag on! http://www.craftyconfessions.com/2011/07/tuesday-confessional-kid-friendly-posts.html. I can't wait to see what you come up with for this week's party! we would love it if you would come and grab a button. So great ideas and tutorial! i love it, and i linked up to my blog. thanks for sharing. This is really well done. And totally neat which is way up my alley. LOL! Definitely going to try this as soon as I get my hands on some glow in the dark paint. This is so cute ! I love this idea ! My husband is at the store and I just called him right now so he can get the materials ! That's Amazing work. Thanks for great article WhatsApp Group Names for friends, schoolmates, colleagues, cousins etc. you Must check it for more. Find out more regarding making use of Fill Flash. Wedding Photographers in Udaipur The elegance of rising high is that you obtain every person's face. Newest Kingroot apk download Android gadgets Kingroot APK and swiftly whereby you can take advantage. Both deals excellent interface with lots of applications. Tutu App supplying paid applications, the TuTu App has other performances as well. The ones USs Gift Cards are Available in each and every single area the USs. prepaidgiftbalance Different shops provide different sorts of gift vouchers cards nowadays. Here we share some information regarding prepaidgiftbalance. Book International tickets Online on puspack travels. Book International tickets Online on puspack. AOS TV is one of the most popular Live TV APK for Sports, Movies and TV Show Streaming on Android OS. The AOS TV hosts channels from many countries that including UK, US, Middle Eastern Countries, India, Iran, Pakistan, Turkey and many more countries. Brilliant! I think it's look really like a firefly. Thank you. Your content is very interesting. If you want to watch Live TV on your Mobile than try HD Streamz APK to watch from around the world.